Striking. A prominent large ruby cabochon emits a six point star from in this Art Deco star ruby cabochon diamond ring. This estate ring features a 6 carat star ruby cabochon that projects a gorgeous six point star. 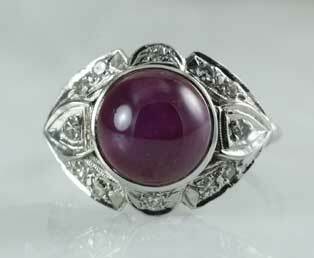 This bezel mounted, purplish red star ruby is mounted in a lovely 1930s 14kt 585 white gold mounting. Twelve single cut diamonds add a warm fire to this ruby diamond ring, while the lacy edges flatter the center stone. This ring has a dynamic mixture of deep red and white that is stunning.